As the central capital of Hawaii, downtown Honolulu is home to a mix of diverse cultures, cuisines, and traditions. Located on the remarkable island of Oahu, this district overlooks the southern shore of the island, with breathtaking views expanding as far as the eye can see. This downtown area is loosely bounded by Vineyard Boulevard and Honolulu Harbor and is brimming with current corporations, businesses, and local government buildings. Its rich history, tropical climate, and friendly neighbors are what makes downtown Honolulu a must-consider destination for home buyers across the state of Hawaii. Dive into the history and ancient culture of Hawaii, through Honolulu’s vibrant downtown district. With numerous museums, restaurants, shops, and parks, this community offers a fun place to learn about the beauty and history of the island. Also enjoy Honolulu’s local beaches and parks, such as the Kaka’ako Waterfront Park, where residents gather to swim, surf, and fish in the ocean. A stroll down South King Street will open your eyes to a wonderful collection of ethnic eateries, unique art galleries, and historic museums, such as the Hawaii State Art Museum and Iolani Palace. As an overall fun and diverse experience, downtown Honolulu is a beautiful place with which residents will fall in love. Downtown Honolulu is divided into four main neighborhoods, which include the Capital District, Central Business District, Waterfront, and Chinatown. 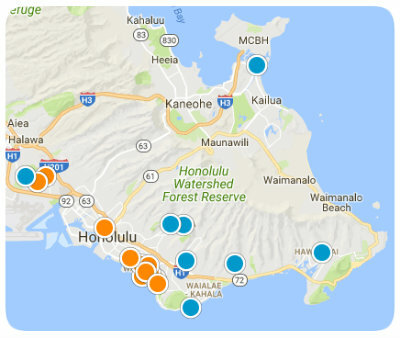 With beautiful real estate options in each district, downtown Honolulu most commonly accommodates condominiums, townhomes and high-rise apartments. These residences are available in anything from 550 to over 1,500 square feet, with spacious layouts and floor plans to accommodate all home buyers needs. With amenities such as full gyms, resort-style pools, and numerous sports facilities, residents will experience quality living at its finest, all while enjoying breathtaking views of the coast. If you would like more information regarding real estate for sale near downtown Honolulu, Hawaii, please allow us to assist you and contact us today.